Greg Roussos is a new barber doing old style barbering at the Wissahickon Barber Shop in Roxborough. Old style is spending more time with the customer, doing scissor over combing and straight razor shaving, he says. Roussos feels that guys these days are often forced to go to “girlie” shops and that they really prefer the old time experience where they can hang out, get a cut, talk sports. But he does women’s hair too. 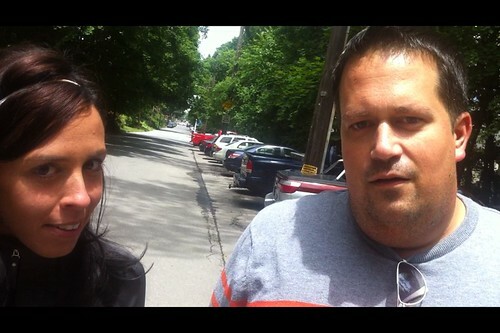 The friend who was helping Roussos put flyers on car windshields on Northwestern Avenue near the horse stables says Roussos always does her hair. “He’s the best.” Watch video interview here. 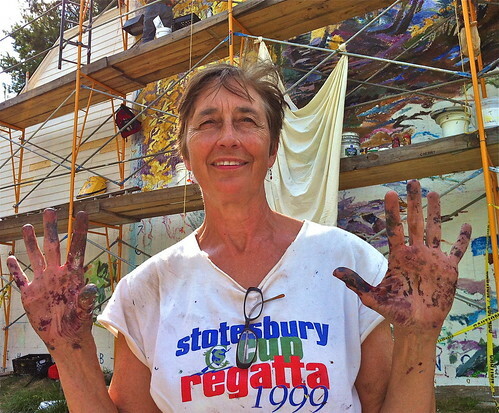 I ask mural artist Ann Norththrup to take a break and hold up her paint-spattered hands. We chat about the watercolor she painted of the Wissahickon Park that she and her crew of helpers are now installing on the wall of Bredenbeck's Bakery, the first mural in Chestnut Hill, Northwest Philadelphia. Watch video here. 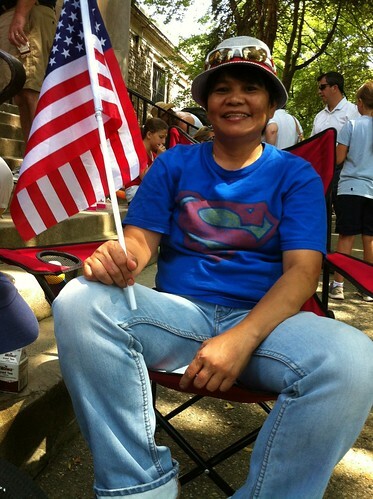 Helen Villagracia, who emigrated from the Philippines to the U.S. six years ago, was wearing a blue and red Superman t-shirt and holding an American flag as she relaxed on a folding chair in front of the Water Tower on July 4th. The Bocce Club’s Independence Day festivities were in full gear- a bike parade, games, magic performance and free hot dogs and ice cream. I asked her what makes her patriotic, this not being her home country. The freedom here, she said, to be who she is. 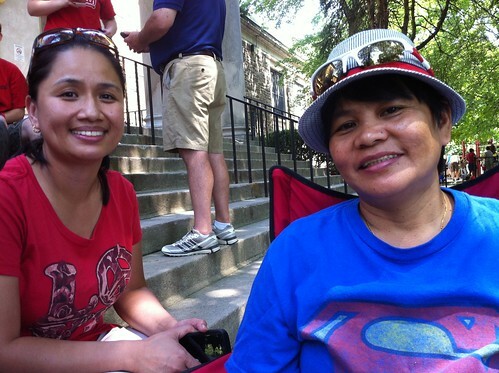 She is lesbian and suffered discrimination in the Philippines, including in employment. Here she works as a caregiver for children. With Villagracia and helping her respond to my questions was Aurora Hermoso, a friend of Villagracia’s partner who was at work that day. Hermoso is a nurse who was one of thirty Filipino nurses whose immigrant visas were sponsored six years ago by New Cortland Elder Services in exchange for a three-year commitment to work for the company. A couple guys in wetsuits were out in the surf kitesurfing on a late afternoon off the Seaside Park beach. The surf was rough and just the day before two swimmers had drowned in the vicinity. I spoke with one as he was packing up his kite for the day. 15 knots of wind or more make for good surfing he said, so it was nice out there. They will go out in winds up to 40 knots. When the winds are stronger they use smaller sized kites. The key to staying afloat is keeping the kite powered up all the time in the power zone, an area of the sky, usually downwind, that has a lot of well, power in it. You have to be able to maneuver the kite in two directions because you need to bring yourself back in. The kite gets inflated with air so if it lands in the water, it doesn’t sink. 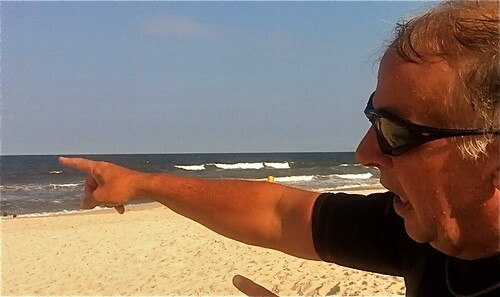 They use surfboards, sometimes, but today were using “twin tips” which can go in either direction. That way you can go right back out after coming in without having to make a turn.